Earlier this year I made a commitment to take better care of myself in both body spirit. Which sounds good in theory but in actuality can be a lot harder if you're not proactive about doing so. About a month ago I stumbled on a new local Pilates studio. I lurked outside for a few weeks before finally going in and grabbing a card to check out their pricing and backstory online. I've basically taken a tour of all the local free intro classes and done all the leg work to discover who has the best studio in town. You're welcome. But finding this studio was basically divine timing. Pilates has absolutely changed my life. I know, it sounds mad cheesy but it's true. I've always worked out in some shape or form since I was a kid. So I'm not new to the world of working out but it's been a minute since I've done anything beyond squats around the house or a brisk walk in the neighborhood. I knew I needed to do something to get my body feeling better but there was no way I was about to take up running or anything like and to be honest, I can't run, even if I wanted to. The way my reconstructed knee is set up, I don't even get going good any more before it starts to remind me that it's been through a lot. But Pilates allows me to move without doing to much damage to my rehabilitated knee. I can go at my own pace and challenge myself as needed. My instructor that first class was intense and with no pre-amble had us jump right into reformer work. 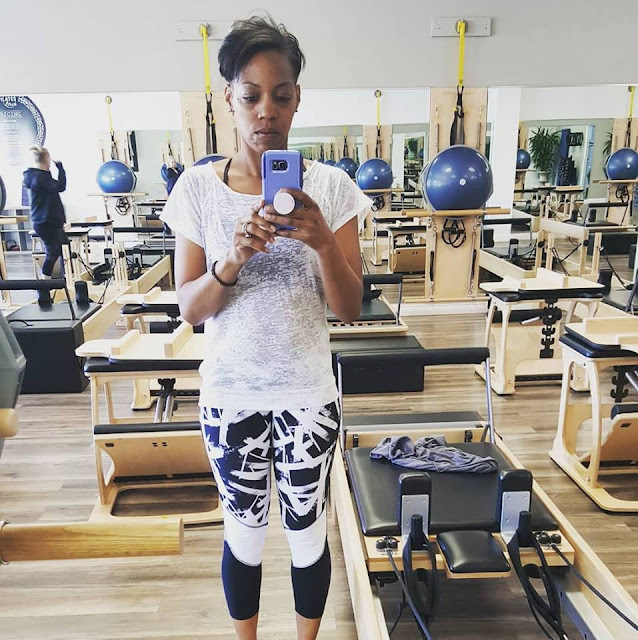 It was only my second time on a reformer and I was a little intimidated but after a 20 minutes or so, things got easier. After my free intro class, they offered me a sweet deal for the month of classes and I quickly signed up. I was hooked. Two more classes in and my badass instructor Gina, encouraged me to take it up a notch and try out the Intermediate class. I was 'bout it so I did. It kicked my tail but in a good way. That was back in January and I've been taking at minimum a class a week ever since. 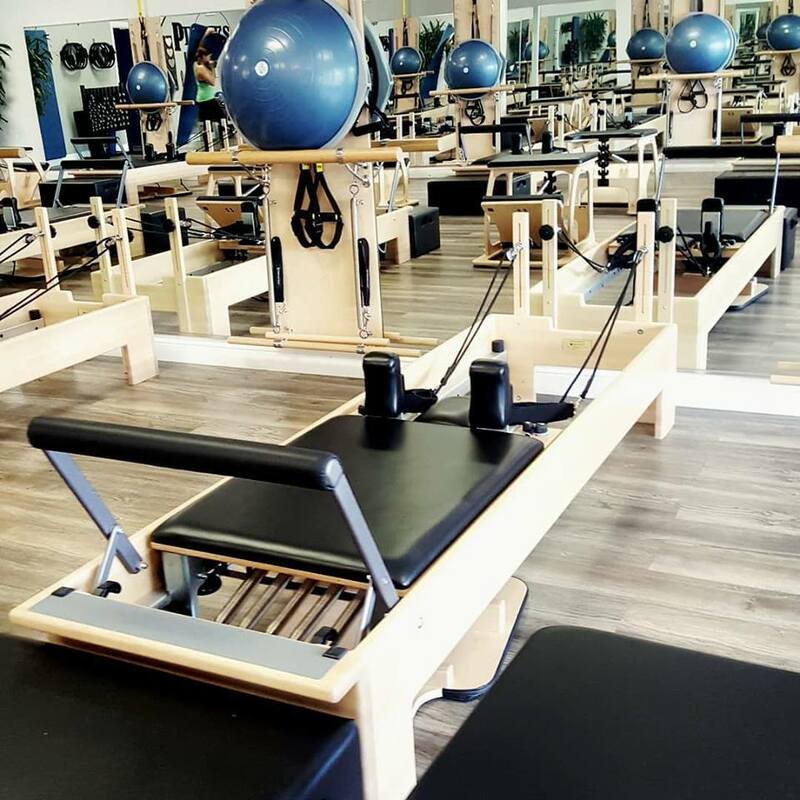 For 50 minutes each class I zone out and focus on the movements, and not falling off the reformer. I'm pushed to what feels like my limits each time and I love that my instructor tries out new things on us. She challenges us in a creative way that has us laughing and pushing ourselves even harder to master these moves. I'm obsessed, I'll admit. I look forward to my class each week and have become one of those people who says "Oh I can't I have Pilates tomorrow; I just left Pilates and I'm so sore", walking around in my toe sox + flip flops afterwards. And I'm totally okay with it. This is my life now. I'm a reformer Pilates junkie and proud of it. Next up: adding in the TRX. Say a prayer for a G, I might not make it! Have you tried any new workouts this year?